Sally Badham 'Beautiful Remains of Antiquity': the Medieval Monuments in the Former Trinitarian Priory Church at Ingham, Norfolk. Part 1: The Lost Brasses. The former Trinitarian priory church at Ingham once housed a magnificent collection of medieval monuments. An important series of seven brasses to the Stapleton family was sold for the value of the metal c. 1800, although their former appearance can be reconstructed from rubbings made in the eighteenth century and other antiquarian sources. This paper publishes hitherto unknown antiquarian evidence for the tomb monuments of John, Second Baron Hastings (1287-1325), in Abergavenny Priory church (Monmouthshire). Sketches made in 1801 by the great antiquarian draughtsman John Carter make possible a new construction of the monument's original form and a reconsideration of its location within the church. In addition, an appendix by the conservator Carol Galvin adds much to our understanding of the way the fourteenth century timber effigy was produced, and how its surfaces were originally decorated with polychromy. Jennifer S Alexander, B W Hodgkinson & Sue A Hadcock The Gylbert Monument in Youlgreave Church: Memorial of Liturgical Furnishing? 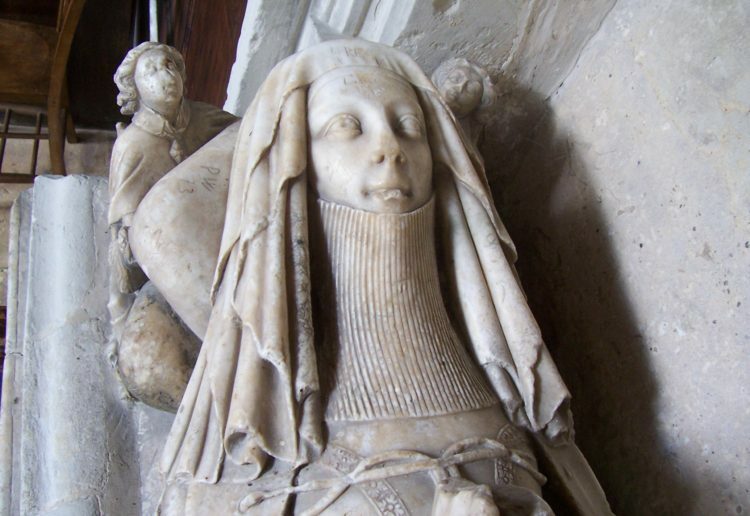 The Gylbert monument is an unusual memorial that it does not fit easily into the canon of alabaster tombs since it also served a second purpose as the retable to the Lady Chapel in Youlgreave church. The extent to which this compromises the design of the monument, in particular its inscription, demonstrates that this was an unusual composition. The layout of the monument, with the donors sharing the picture space with a sacred image, invites comparison with imagery on tomb chests although the difference between the Gylbert and these monuments are apparent. The original form, function and siting of the monument at Youlgreave are discussed and its role in the church assessed. Cardinal Erard de la Marck, Prince-Bishop of Liège from 1482 to 1538, had his monument erected in the middle of the choir of the cathedral of Saint-Lambert during his lifetime in 1528. The monument was in 'gilt-bronze' (gilt copper alloy) and had an unusual iconography; it disappeared in 1794. Travellers praised it, but drawings or prints illustrating it are rare and also contradict each other. A recently discovered unpublished drawing and an accompanying description form the basis for a new reading of the monument as it was originally. The critical examination of this material leads to the conclusion that the monument was drastically altered at least once. This paper argues that the tomb of Sir Robert Dormer (d. 1552) in the north aisle of Wing church is not of a single period , but it was developed in three stages over thirty years. The first stage was a free standing tomb chest located slightly further east with two inscription plates on its lid. The second stage, here dated to after 1571, was an elaborated tomb with a canopy supported on Corinthian columns and with family shields on the rear (north) wall that we see today. The third stage, conceived in 1590, abandoned the idea of a joint family commemoration when an ornate monument with effigies to Sir William Dormer (d. 1575) and his second wife Dorothy was erected in the chancel. The intended inscriptions on the rear wall panel and upper frieze were never painted. This paper considers the Church of England's approach to the controversial subject of removing monuments or part of monuments from churches. 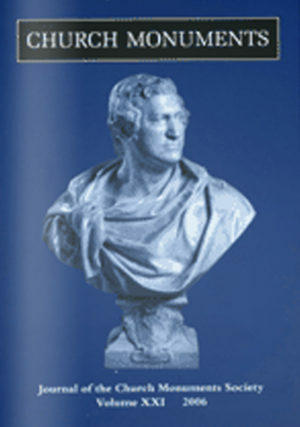 Its starting point is the renewed controversy over Roubiliac's celebrated bust of the ninth earl of Pembroke (c. 1750), which was sold from a church in Wiltshire in 1997 and then reappeared in auction in 2005. While that case was preceded by numerous consistory court cases where faculties had been granted for the removal of monuments, or parts of them, the trend of decisions in similar cases in more recent years renders the prospects of success almost negligible in future similar applications. This paper also examines the wider context of the removal of important works of art from specifically designed settings, often in listed buildings (e.g. Canova's Three Graces ) , and demonstrated how the consistory courts have developed a more robust attitude to the matter than have the secular authorities. Frits Scholten and Monike Verber From Vulcan's Forge. Bronzes from the Rijkmuseum, Amsterdam 1450-1800.